A day after the Narendra Modi government sought Supreme Court's permission to return the ‘undisputed’ land around the Ayodhya disputed site to a Hindu religious trust, the ruling Bharatiya Janata Party (BJP) president Amit Shah on Wednesday reiterated the saffron outfit’s commitment towards the construction of the Lord Ram temple. Shah also charged the opposition Congress with resorting to various tactics to delay the resolution of the vexed issue, which is sub-judice in the Supreme Court (SC). On Tuesday, the Modi government had filed a petition in the SC seeking the permission to return 42 acres of land to a litigant in the Ayodhya title suit case, Ram Janmabhoomi Nyas. The land was acquired by the Centre in 1993 after the demolition of the disputed structure on December 6, 1992. 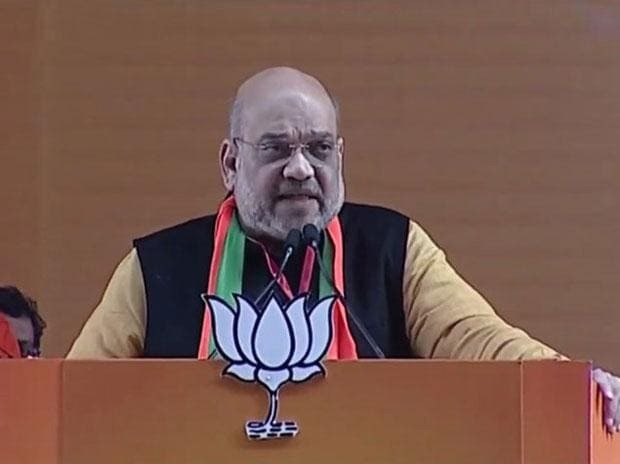 Addressing the booth level presidents in Kanpur this afternoon, Shah claimed while the BJP was committed to the Ram temple cause, the Congress had always tried to defer the hearing of the case in SC either by seeking its deferment in wake of the 2019 Lok Sabha polls or by threatening to impeach the chief justice of India (CJI) hearing the case. “The filing of the petition in the SC for returning the 42 acres land to the Nyas is a big and historic step by the BJP and I want to thank Prime Minister Modi for taking such a gutsy decision,” Shah said amid chants of Jai Shri Ram by the enthusiastic party workers. He also exuded confidence the matter would soon be resolved and the Ramlala, the Lord Ram deity currently presiding under a makeshift temple, would be housed in a grandiose temple structure. Meanwhile, Shah invoked Modi’s famous “56 inch chest” jibe against the opposition parties, especially the Samajwadi Party (SP) and Bahujan Samaj Party (BSP) pre-poll alliance saying they lacked both leaders and policies. “Our leader is Modiji, but who is the leader and the prime ministerial candidate of the opposition front,” he said adding that under the hypothetical alliance government, their leaders would become PM by rotation. On Monday, Mayawati would be the PM, on Tuesday Akhilesh Yadav, Wednesday Mamata Bannerjee, Thursday Sharad Pawar, Friday Deve Gowda etc, he noted. He referred to the surgical strike by the army across the border in Pakistan following the Uri terror attack in the J&K, saying while the Modi government resolutely avenged the terror attack, the previous Manmohan Singh government merely proved to be a sitting duck and lacked political will to thwart such incidents. Shah maintained the opposition parties were closing ranks due to the rising popularity of the BJP and Modi, but asserted the saffron party was confident of returning to power with even greater number of seats than in 2014 Lok Sabha polls, when it had scooped 73 of the total 80 seats in UP. He further attacked the Congress over the purported dynastic hold in the party and listed the names of various PMs and leaders of the Nehru-Gandhi family, including the current president Rahul Gandhi.